Last Thursday I ran a session of John Harper’s Blades in the Dark for seven other players. Beforehand, I read the rules, printed the handouts, and assembled my GM screen. John Harper crafts an evocative setting into the rules - ghosts, soot, capitalist feudalism surround the aspiring crew of miscreants. At present, I’m running a drop-in style game at my FLGS. From week to week the cast of characters varies. I’m well aware of the challenges of campaign cohesion as the characters move through different regions of the campaign world; and no two sessions have the same group playing. Blades in the Dark offers several elements to ease the challenges of a rotating cast - the crew, turf, and game phases. The players create a shared “character”, the crew, and develop it through their exploits. 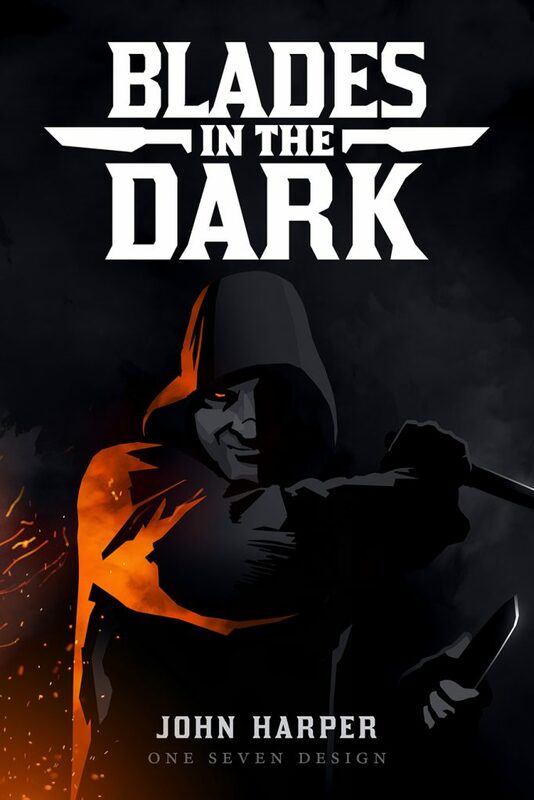 Blades in the Dark provides 6 base crews: assassins, bravos, cult, hawkers, shadows, and smugglers. These crew types suggest how the player characters will approach solutions. The crew also modifies aspects of the characters. Crews control turf. The more they expand that turf, the greater power and options they get. This encourages play to remain close to a home-base. The game phases provide a strong structure of play. We have free-play - a time for reconnaissance, information gathering, and general role-playing. And we have the score - a time for an illicit endeavor that will bolster the wealth and reputation of the crew. Downtime immediately follows the score. During downtime the GM gives the payout in coin and reputation, determines the heat and entanglement. Then the characters perform their activities: acquire an asset, work on a long-term project, recover, reduce heat, train, or indulge a vice. I appreciate that the Downtime phase of Blades in the Dark helps me close out sessions so that I can easily account for character changes in the next session. The structure of the crew creates a continuity to a changing cast of players. And the entanglements and turf ensure the dynamism of the city of Duskwall. I love the procedures of a system. They explain in clear steps the transition from one moment of play to another. These procedures transition the game from free-form into and out of an action. The Downtime procedure moves the game from the Score back to free-form play. And as I said above, it feeds the campaign. The Planning & Engagement procedure moves the game from free-play to a Score. Crews gain vital wealth and reputation from each Score. Once the characters determine a potential score, Blades advocates that they identify a missing detail for the type of score. For an assault, the crew details the point of attack. At this point, the GM moves into the Planning & Engagement procedure. Each character determines their load; How much gear they have (not the specific gear just how many slots of gear). Is this operation particularly bold or daring? If yes, +1d. Is this operation overly complex or contingent on many factors? If yes, -1d. Does the plan’s detail expose a vulnerability or strike at a weakness? If yes, +1d. Does the plan strike at a strength or special preparation? If yes, -1d. Can any of your friends or contacts help? If yes, +1d. Are any enemies or rivals interfering in the operation? If yes, -1d. Is the target of a lower tier? If yes, +1d. Is the target of a higher tier? If yes, -1d. With the dice pool assembled, someone rolls and determines to determine the initial position - what the opening scene of the score looks like. The engagement roll sets aside the potentially game paralyzing planning and pushes the game into the action. Players do have access to Flashbacks for planning and resources. As a caveat, if your group enjoys planning, preparation, and pre-determined equipment; the Load Out, Engagement, and Flashbacks may not be for you. You may want to require players choose their individual items for the score, create any assets (eg. bribed guards), and layout the details of their plan. I still believe the engagement roll provides a valuable tool for transitioning from planning to action. If you have ever had a group of 6 PCs each attempt to sneak around a location, you know that in most systems it will inevitably fail…and likely devolve into combat (e.g. can’t sneak around it, better bash in the door and kill everything). Blades adds a fantastic mechanism in which someone can lead a group action. The leader need not have the best action rating. Everyone rolls for that action and the highest result determines the success of the group action. However, each individual failure for the group action inflicts one point of stress on the leader of the group action. In other words, you’ll have a competent group but at a potential cost. From a meta-standpoint, this mechanic also helps keep the characters together (and thus keeps the fictional state more manageable for the GM). I first saw countdown clocks in Apocalypse World, but prefer the direction Blades takes in leveraging clocks. The countdown encodes events that might happen or obstacles to overcome. A quick note-taking tool that a GM can share with players to provide visual clues for the state of the game. Clocks also behave a bit like hit points. Characters succeeding on actions can chip away at a countdown clock’s pie pieces, nudging them to actualization. I love success with complications. Blades offers guidance on different complications based on fictional positioning (e.g. controlled, risky, or desperate). However, as with all success with complications, beware of not turning the complication into something far worse than would have happened for outright failure. Blades encourages (perhaps mandates) the GM to broadcast the position and effect of a given action. “You are skirmishing with a street thug, that’s certainly a risky position with standard effect.” This helps players understand the rubric through which the GM runs the game. It clarifies what players can expect. It also creates a point where players can shift the GMs rubric (for better or worse). Teamwork extends beyond Leading a Group Action. One character can help another character, protect them, or set them up through an action of their own. These are echoes of Burning Wheel’s Linked Test and Helping Dice. Plenty of tech to reinforce the idea that characters belong to a crew and have each others back. Blades has a handful of random tables to assist the GM in fleshing out Duskwall; Enough to help craft people, buildings, streets, demons, and forgotten gods. Echoes of a Sine Nomine product. Blades’s resistance mechanic gives players tools for tempering the consequences that a GM inflicts. Resistance comes at a cost: increased stress. Stress is analogue to character hit points, but is more akin to Fate’s stress tracks. Characters can manage stress by indulging in a vice (which also has a neat little procedure). What constitutes a controlled, risky, or desperate position? What constitutes a great, standard, or limited effect? How many pie pieces go into that count down clock? What does success with consequence mean? How hard do you hit with failure? How the GM and table answers these questions determines the tone of the game. Channeling years of experience GM-ing several different systems, I found the calibration liberating. I started out more forgiving. However, when the Leech failed wrecking a door using their explosives kit (their self-described wrecking kit) in a burning building, I hit hard with 4 Harm (eg. lethal Harm). Through resistance and armor they mitigated the worst of it. If we continue, that 2 Harm will linger and complicate situations. The campaign should strive to ensure a consistent calibration level based on precedence; Ease into any deviation from that precedence. Other games require calibration, Blades puts it forward as a first class consideration. We had one combat. I opted for a teamwork Skirmish. While the conflict felt fast and cinematic, in hindsight I would’ve opted for individuals actions. And there-in lies a tension in the game. Teamwork for combat? Helping? Individual rolls? Each can work. But which makes the most sense for the group? Do I ask the players what they prefer (in that moment)? The varied approaches to conflict and action resolution may feel off-putting - They did introduce a bit of doubt and personal dissonance during the game. I enjoyed running Blades in the Dark. The game structure works well for open-table gaming - make sure to end your session with downtime activities. The entanglements applies pressure and ensures a dynamic world that moves through and against the characters. I look forward to both the stretch goal hacks and the inevitable community hacks. I know that Victorian Ghost-Punk may not appeal to everyone, but the underlying system resonates with my GM-ing style. Blades provides ample advice and guidance, but if you need exacting precision, you won’t find it. Blades gives GMs guidance and a framework to run their game for theirtable. As with any RPG, Blades lives and dies on the trust between GM and players. I love the interlocking systems of Blades in the Dark. It is a solid framework for running many of the games I like to run. When running the game I never had the “Well, lets just Math this thing” feeling that I get when I ran or played Fate. I felt as though the table mentally remained in the fiction instead of scrounging around the table looking for aspects to invoke. If you’d prefer a different setting take a look at Scum & Villainy; A space hack of Blades in the Dark with Star Wars and Firefly touchstones. Blades in the Dark by John Harper by Jeremy Friesen is licensed under a Creative Commons Attribution-NonCommercial-NoDerivatives 4.0 International License. Based on a work at https://takeonrules.com/2017/07/04/blades-in-the-dark-by-john-harper/. Permissions beyond the scope of this license may be available at https://takeonrules.com/more_permissions/.